On the evenings that I would put Sr. Miriam to bed, I would sit on the edge of her bed, hold her hands, and pray the same prayer every night. “Dear God, please be with Sr. Miriam as she goes to sleep. Help her to have a peaceful night so she can wake rested and relaxed with a clear mind, able to think of anything she needs to think of, say anything she needs to say, and go anywhere she needs to go. May she feel all the love that we have here for her, and may she love us just as much back.” On May 12, 2017, this prayer was finally answered. 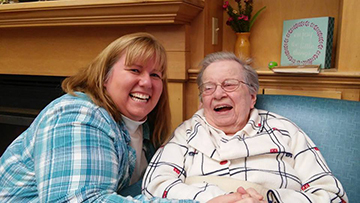 Sr. Miriam woke rested and relaxed with a clear mind and is now able to think of anything she needs to think of, say anything she needs to say, and go anywhere she needs to go. Sr. Miriam was a woman of remarkable intelligence, and her intelligence is one of the first things that drew me to her. I looked up the Benedictine Sisters of Annunciation Monastery online before visiting the community and read Sr. Miriam’s biography. I discovered that she was a true scholar who travelled throughout the United States teaching, lecturing, and giving retreats. I also learned that she had helped write the book, “Medieval Women Monastics.” I promptly ordered the book from Amazon and brought it with me on my first visit to the monastery hoping to have her sign it for me. I was able to sit at the dinner table with her one evening and I had the loveliest time with her that night. The meal ended with her asking me to write her a letter to tell her what I thought of the book after I had finished reading it. That was the start of a beautiful friendship. We wrote many letters back and forth to each other until I eventually moved to Bismarck to join the monastery. Upon moving into the monastery, I developed and even closer relationship with her. I genuinely enjoyed her company and relished being in her presence. I knew very well that eventually her Alzheimer’s disease would rob her of the information that she had spent years studying. I made it my mission to consciously learn as much from her as I possibly could. I thought I would be learning about medieval monastics and mystics, like Hildegarde of Bingen whom she dearly loved, but instead, I learned more important things. The things I learned about Hildegarde of Bingen became a bonus. I think the most significant thing I learned from Sr. Miriam is how important presence is. When I was with Sr. Miriam, I was with Sr. Miriam. She gave me her undivided attention. She was not worrying about what she was going to do next, nor was she thinking about what she was going to say to me as I was still talking. She listened and gave me her full attention. She always put a lot of thought into what she said back to me and I tried do the same for her as well. Sometimes there were not even words needed to know that we were there for each other. One evening will be forever engrained in my mind and it is probably one of the most important things I have ever learned about being human. When Sr. Miriam was still able to independently go to prayers and meals, she and I had a ritual of walking back to her bedroom after dinner and visiting until it was time for evening prayers. On one particular evening, her Alzheimer’s had brought her to a breaking point. She was struggling so hard to find words it brought her to tears, and me as well I might add. Not wanting to cause her more frustration, I thought it was best for me to just leave so she wouldn’t feel like she had to try to talk. I expressed this to her, and she immediately said, “No, please stay, I need your presence.” So for the next 20 or 30 minutes we sat on the edge of her bed holding hands and resting our heads on each other in complete silence. That evening, she taught me that presence means more than anything in a relationship, and that sometimes words just get in the way. I am acutely aware that Sr. Miriam had some difficult times in community; however, I never once heard her utter a bad word about anyone. When talking about her time as prioress she only ever said, “It was a hard time.” I can’t help but think of something one of my favorite priests told me about a particularly hard time he was having in a new parish. A few of the parishioners did not care for him and they were very verbal about it. One day, he had a chat with them and explained to them that they needed to realize he was not there for them…he was there for someone in that parish who needed him and God placed him there for that reason. Sr. Miriam was placed here for a reason, and she made me feel like it was for me.